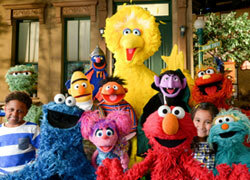 Discussion in 'Classic Sesame Street' started by redBoobergurl, Feb 24, 2005. Do you ever find yourself going about your day and all of a sudden you'll see something that will remind you of a Sesame Street song and then it gets stuck in your head? For me this happens everytime I see a bus stop. I start singing the song that goes "Bus Stop, Bus Stop, Standing in line, waiting at the corner at the bus stop sign" It had Fat Blue and bunch of Anything Muppets waiting in line for a bus stop. Once it gets in my head it takes the whole day to get it out again! It's been years since I've heard the song too! I'm not saying it's a bad thing, but it's kind of funny! I don't know how but everytime I start washing dishes at work I start humming Do The Rubber Duck. Drives my boss bananas because she starts singing it too. "If I could only paddle like a doggie putta paddle, I would paddle my way to you..."
"Cheep cheep chirp chirp, cheer up cheer up cheer up, cheep cheep chirp chirp, cheer up cheer up cheer up. Chirping's the way we keep our spirits up, so cheep cheep chirp chirp, cheer up cheer up cheer up!" I like the 'I am a fine musician' skit from season #1. Since recently seeing this, that song is in my head a lot. I really like Don Music, so all the songs he sang with help of Kermit I like. I also like alot of the non muppet songs but the one that I never get out of my head is the song about pockets. My mom would sing along whenever this song was on. I always remember the girl wearing overalls in one scene and many others including the woman wearing a tan coat opening the pocket that had a flap with a snap as well as the woman wearing a long white sweater with her hands in the pockets. My mom wore overalls as well as blue slacks with pockets and dresses with pockets; she always had her hands in her pockets. I wish I knew how this song goes entirely! I also like oscar the grouch's I love trash and other muppet songs like the telephone rock and the bus stop song that has 2 guys with beards & 2 girls, there girlfriends, one was named Sue. Does anyone remember this one? I forgot one more that I sing all the time, "WHO ARE THE PEOPLE IN YOUR NEIGHBORHOOD". I add different people in it like a garbage man's a person in your neighborhood or something else. I wish Bob would sing this song more. 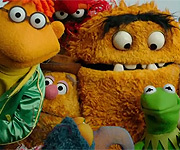 A lot of the songs & sketches from Muppet Magic,SS,FR &TMS are constantly going through my mind on a daily basis;helps to pass the time away & saves me from constant boredom. Do you mean Capt. Vegetable? "It is I! Captain Vegetable, with my carrot and my celery!" Not neccesarily. Xylophone as it's spelled wouldn't work, despite the fact it has a zzzzzz sound. I often sing "Cooperation, makes it happen...cooperation...working together!" Whenever I think I'm cooperating with someone. Ok, I've got another one. I was saying goodbye to the kids in my after school program and all of a sudden I'm singing "Goodbye Fly, Fly listen to my song, Goodbye Fly, Fly back where you belong"
I think there are some verses to this one. All I can remember is Maria singing it. Does anyone else remember this song and any other details about it? I can't get it out of my head now, but all I remember is the refrain I wrote up above! Well, it was a cast insert song. A bunch of different cast members sung the different verses. Gordon sang "A fly flew on my toe", Maria sang "A fly flew on my knee", Luis sang about the thigh, Big Bird sang about his chest, Bob sang about the nose, and Gina sang about the hair. And during the refrains, everyone sings. That's right! I remember it even better now! I still don't know why it randomly popped into my head yesterday. Now I can't get it out of my head! Big Birds "Mistakes" gets stuck in my head when someone does something that makes them feel down. Songs that get stuck in your head?????? They're better than an AXE any day!